Ever been scammed out of your valuables? Ever lost your account to a nasty hacker? This guide here will tell you all the ways that you can do to prevent and protect yourself from being hacked or scammed. It is best that you read the guide completely, and perhaps remind yourself of the tips in it whenever you are playing Runescape. I strongly believe that if every player of Runescape are clever and well-prepared enough not to get scammed or hacked, it will greatly reduce the bad elements in Runescape and discourage them from carrying out their attempts at ruining the game. Scamming is to deceive or trick another player for one's own personal gain. Deliberately lying to others about how much an item is worth and the rarity of an item is considered a scam. A trade that seems too good is most likely a scam and thus you should be extra careful when you are trading. Remember that Jagex cannot and will not return any lost or stolen items, so it will most likely be your fault if you get scammed. Also, lying to players to gain account information is also considered password scamming and should be reported instantly. This includes claiming an unrare item rare. It also includes claiming an item's ability to do something that the item cannot do. Asking a player to drop an item and press alt+F4 is a scam as pressing the keys closes the Runescape window, allowing the scammer to take your items away. This is almost always a scam, as the scammer will ask you to give something to him and promising to give it back. Remember that trades aren't reversible, and you may never get back your items! Always report such instances and never engage in a trade like this. This happens when the scammer switches his items without you noticing. To avoid this, be careful to check the second trade screen and make sure you are getting what you deserve. If a trade has been changed, a large flashing exclamation mark will appear, so this should help in determining whether the player can be trusted in a trade or not. Remember that no one (not even members) can upgrade or trim armour for you. The (t) and (g) armors you see in game are all gotten from Treasure Trails, a mini game for members. Do report all instances where a player offers to trim or upgrade your items. Just like the scam above, there is absolutely no way anyone can duplicate your items. Be careful and report when you see anyone offering to do that. All Jagex moderators have a gold crown next to their name. (In private message as well) In addition, their names always start with a "Mod". Remember never to believe in people claiming to be Jagex in order to gain your items, they are most likely scamming and you should report them under "Item Scamming". Even though it may not always be a scam, most of it usually turns out to be trust game/trades. So do be careful and report immediately when it turns out to be scams. Be careful of players selling strange items for high prices. You may see that a player is selling an item at a certain price and another player buying the same item at a higher price. Be very careful of such scams, and make sure you know the item well before buying it. The above is not only against the rules of conduct, but also might be a scam. If you see anyone doing so, report them for Account sharing/trading. Be careful of all luring scams, as the scammer may attempt to get you killed (either by NPCs or by other players) to gain your items. Kindly decline if you know what the player is offering you to do is dangerous, it's not worth to show off and lose your items as a result. Someone might attempt to trade you the "RuneScape Sword". This sword is a rumor and nothing more. If someone tries trading you a sword that isn't called the "RuneScape Sword" but they say the sword is, it's a scam. From time to time, you may see players claiming that Jagex blocks passwords from showing in the chat window. Be aware that it is totally *not* true! Never attempt to type your password out unless you want your account stolen. If anyone claims that Jagex blocks passwords, report him or her for "password scamming". Sometimes, players can ask you questions that are part of the recovery questions, be careful when answering them so as to keep your recovery questions and answers safe from scammers. Remember *never ever* give out your bank pin to anyone! No matter what the scammer might say, it is all a scam to get into your bank and take away your items! If anyone asks for your bank pin, report them under "password scamming". Take note that there is no such thing as free membership. All members are subscribed to Jagex, so if anyone offers to give you free membership, report them for password scamming. The reason this is a password scam is because the scammer will ultimately ask for your password in order to give you the so-called "free" membership. While it is not good to manipulate prices, selling an item for a high price or low price is not necessarily a scam (the reason being that some players may not even know how much the item is worth). If you want to be secure, just check a price guide and you will find the correct price to an item. It might not be very secure, but such services are not always scams. If you are feeling insecure, just look at the hiscores to see if the player have the necessary skills before trading. Or you can ask him to trade another item for your item, so ask to make sure. If the player insists on not wanting to trade an item in return, it's best to not trade with him. If you got item scammed, the most logical thing to do is to report the scammer under "Item scamming". Be more careful next time and not make the same mistakes again. If you got password scammed, report the password scammer under "Password scamming". Immediately change your password (before the scammer does so), and perhaps change your recovery questions (or set new recovery questions if you have not done so). Make sure your password is complicated enough (a mixture of letters and numbers) but can be memorized. Q: I accidentally fell for a password scam, and now my password is changed. What do I do? A: Go to the RuneScape frontpage and click on the link that says "Recover a lost password" under the Account Recovery section. Type in your Runescape username and select the option "Someone else has changed my password". Fill in as many details as possible and check twice before submitting the form. Wait patiently while Jagex recovers your account. Q: My recovery questions are changed by a scammer! What do I do? A: In such case, the scammer might already know your password. Immediately change your password before the scammer does! 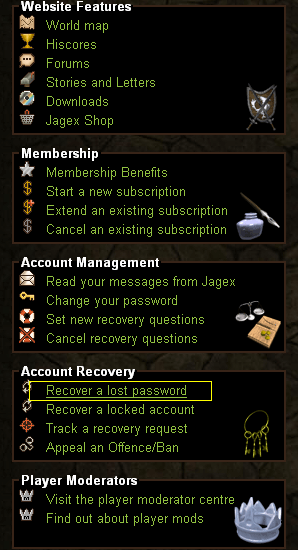 Go to the Runescape frontpage and click on "Recover a lost password" under the Account Recovery section. 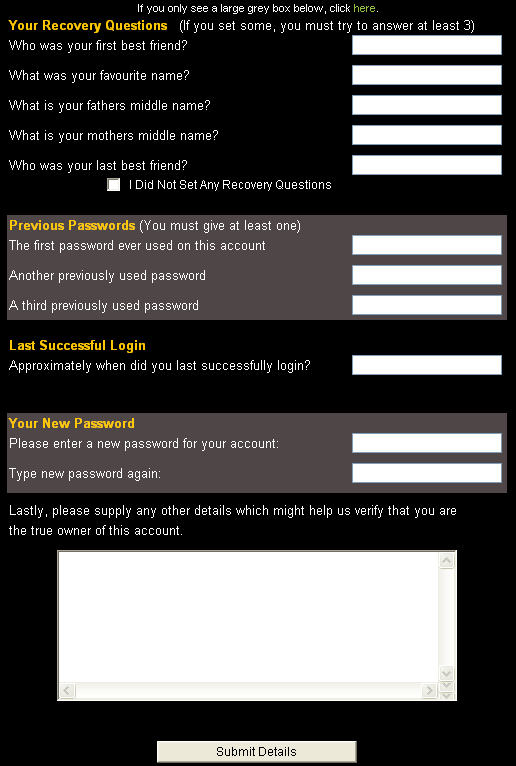 Enter your Runescape username and select type of query as "Someone else knows my recovery answers". Fill in as much information as possible on the next form. Wait patiently for Jagex's reply. A: Go to the RuneScape frontpage, click on the link that says "Recover a lost password" under the Account Recovery section. Type in your RuneScape name and select the option "Someone else has changed my password". Fill in as much details as possible and check twice before submitting the form. Wait patiently while Jagex recovers your account. Q: Someone is holding a drop party, but he didn't drop anything. Is that a scam? A: No, it is not. Scamming involves taking a person's item. In this case, he didn't take anyone's item but just merely played a joke on everyone. Hacking is the stealing of personal information such as passwords. The hacker will attempt to install a keylogger or trojan on your computer to harvest your passwords and other personal information. Many sites can contain keyloggers and it is best that you do not visit such sites. Also, be careful of any applications that strangers send to you as some of these programs can contain nasty things that hack into your computer. Sometimes, a window may appear on your screen when you log in, and a link is there for you to click. Remember never to click these links as they are often viruses or keyloggers which have been sent through the messaging system. Also, never download any programs from MSN as they can contain trojan and other viruses. Many of these sites that offers to do such things often contain trojan or keyloggers that steals your password. Believe me, there are no such thing as "free lunches", all these benefits are fake and they are there to attract you to the sites. There have been many cases when players receive emails offering them Player Moderator status and free items. Do *not* visit the links inside the emails as they may contain keyloggers. Neither should you download anything in such emails. Remember that Jagex will *never* contact you through email, and in no way will they offer you anything through emails. Many of these programs (autotypers, autominers etc) contain trojan and keyloggers which are there to steal your password, so you actually risk your account by downloading them. Also, downloading such programs is in breach of Runescape rules of conduct (Rule 7). So think thrice before you download any of these softwares. This is the least possible way that anyone can get hacked, unless your password is too easy. Hackers may try to guess your password, and if they are lucky, they may just get it right and hack into your account. However, if you have a pretty good password, this is highly unlikely to happen. Suspicious attachments (don't ever download them). Third party programs (don't use them). Emails with links/attachments (don't click/download anything in them). Websites offering Runescape benefits (don't enter your RS pass there and don't visit them). Entering your Runescape password on other sites (never do that, only enter it on Runescape.com). If you have been hacked, the best way is to do a virus scan and recover your account. Install a good anti-spyware software and have a good firewall as well. Make your password as complicated as possible (but can be easily memorized). Make sure your password isn't related to you in any way. Visit the Stronghold of Security. Set a good bank PIN (make sure it's not something related to you). Q: I think my computer has been keylogged, what do I do? A: Do something! Scan your computer fully and remove these harmful elements. Then change your RuneScape password immediately, perhaps with your recovery questions. Make sure you have a good firewall as well. Q: I just visited a site offering Runescape benefits. Is there anything I should do? A: Yes, you should definitely scan your computer for keyloggers and trojans. If you find that you have caught one of these things, remove them and change your Runescape password. Get a good firewall too.